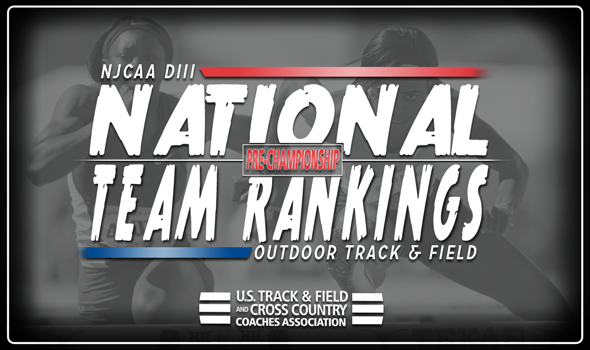 NEW ORLEANS – The NJCAA Division III Outdoor Track & Field National Championships are this weekend, and the National Team Rankings heading into the final meet of the season shows who to watch for on the podium when it’s all said and done. Rowan-Gloucester (N.J.) CC continued to hold down the top spot on the men’s side of the rankings as it looks for its first outdoor title since 2014. However, the Roadrunners were supplanted for the top spot in the women’s rankings for the first time this season by Kingsborough (N.Y.) CC, which is looking for its second-straight title. The NJCAA Division III Outdoor Track & Field National Championships will begin on Thursday, May 10 before wrapping up on Saturday, May 12. The meet will take place at Mohawk Valley CC in Utica, New York. Rowan-Gloucester (N.J.) CC will head into Utica, New York, with a commanding lead in top-10 NJCAA Division III Descending Order List performers. The Roadrunners boast 34 top-10 marks, with 12 sitting amongst the top-3 which also leads the nation. Kingsborough (N.Y.) CC, which won the title a season ago, sits second in the rankings, as well as in top-10 Descending Order List marks with 21. However, the Wave owns seven NJCAA Division III-leading marks to Rowan-Gloucester (N.J.) CC’s four. The Wave could muster a ton of points in those seven events should its athletes hold their ground. Rounding out the top-five heading into the final meet of the season were Suffolk County (N.Y.) CC, Harper (Ill.) and Triton (Ill.). All three programs remained put from a week ago. The trio also marks the only other schools with double digit top-10 Descending Order List marks, as Suffolk County (N.Y.) CC has 19 while Harper (Ill.) and Triton (Ill.) sit behind the Sharks with 16 and 15, respectively. Kingsborough (N.Y.) CC waited until the last possible moment to make a move in the rankings, but that’s just what it did. The Wave competed at the Tom Farrell Classic this past weekend where it hit seven top-10 NJCAA Division III Descending Order List marks, which gave them just enough to surpass Rowan-Gloucester (N.J.) CC in the rankings. The Wave own 26 top-10 NJCAA Division III Descending Order List marks and six NJCAA Division III leading marks heading into the final meet of the season, which is good for tops in both categories. But the Roadrunners will not go away quietly, as its 25 top-10 NJCAA Division III Descending Order List marks should make for a very close finish in Utica, New York, this weekend. Four teams in Harper (Ill.) (19), Suffolk County (N.Y.) CC (17), Middlesex County (N.J.) CC (15) and Union County (N.J.) (12) feature double-digit top-10 NJCAA Division III Descending Order List marks. Those programs also sit third through sixth in the rankings, respectively.